Our favorite part of We Heart-ing companies is, of course, getting samples sent to the office. Ojai Energetics CBD was certainly no exception. We've spent the past few weeks cooking our veggies in tasty CBD coconut oil and mixing their CBD elixir it in our coffee to quell the morning jitters. 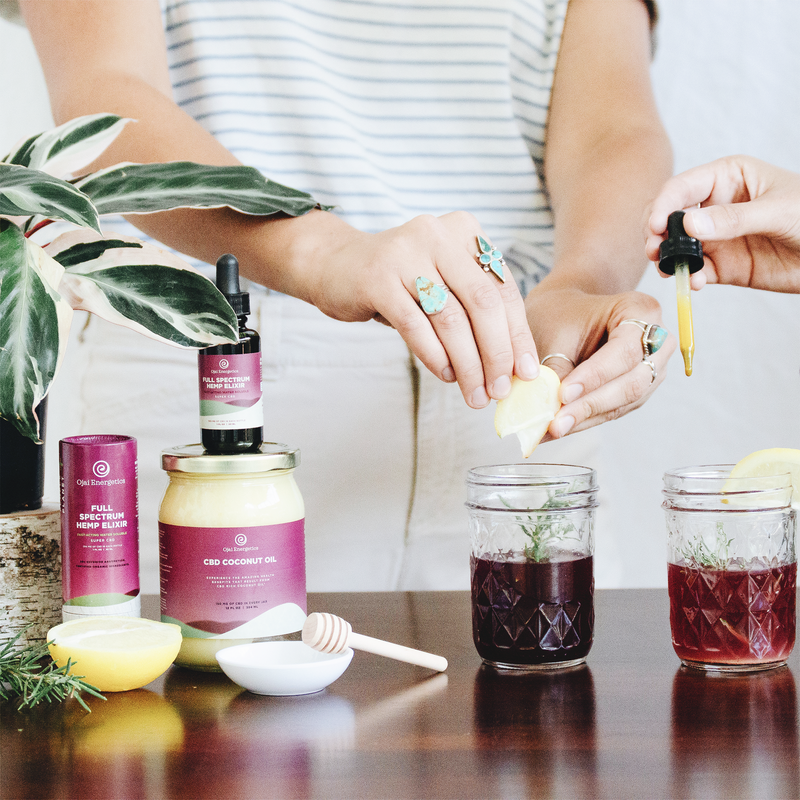 Our team is officially obsessed with Ojai Energetics, and we think you will be too. He wanted to create something that he would feel good taking, and feel comfortable giving to friends and loved ones. Will wanted to make the most effective and clean CBD rich hemp products possible, in manner that was in alignment with his values around sustainability and love for the planet. Thus, Ojai Energetics was born! We love Ojai Energetics for a lot of reasons, but a big one is because they only support regenerative farming and fair trade practices that use certified organic methods, or beyond organic methods like bio-dynamic or permaculture systems. For every ingredient! Their products are completely devoid of any synthetic or synthetically modified compounds. And it goes beyond the product, to their packaging too. They use veggie inks and eco-friendly labels printed in the US. They're also working on an exciting new project, collaborating with national labs and clean energy technology, to utilize the ‘left over' parts of the hemp. CBD has no shortage of health benefits, including neurogenesis of the brain. You can read all about the benefits of CBD in this article, but here are a few notable ones. Highly concentrated doses of CBD oil have been successfully used to treat epilepsy in a number of research studies. CBD hemp oil is well known to reduce feelings of stress, as well as prevent depressive episodes by increasing the levels of “positive” hormones and neurotransmitters in the body. Meet the only full spectrum hemp oil thats water soluble and made without synthetics or synthetically modified compounds. Most feel the effects in under 30 seconds, and you would have to take 5000mg of a regular CBD rich hemp oil to get effects of our 250mg. Its also loaded with some of natures most powerful super foods like moringa, and acerola cherry. Use code trycbd15 for 15% off your order! Do you have a discount code for repeat buyers? It doesn’t mention how good it is for pain. That’s what we need. Thanks. Just curious … how long will the discount offer be available? Thank you.